L'Oréal Majirouge contains Ionène G™ and Incell™ that strengthens and reinforces hair fibres whilst conditioning. Majirouge can lighten up to 3 levels and each shade gives perfect coverage of up to 100% white hair. L'Oréal Majirouge Carmilane™ features exclusive technology which forms an incredibly strong bond with the hair fibre to help secure the colour deep within it. The result is red with a unique, multi-dimensional structure with L'Oréal's best ever fade-resistance. 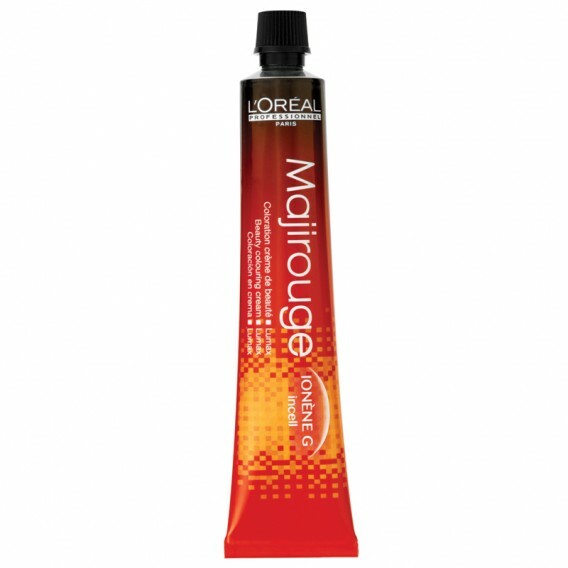 L'Oréal Majirouge Rubilane™ patented technology delivers longer-lasting, pure, vibrant and intense reds and coppers. L'Oréal Majirouge contains Ionène G™ and Incell™ that strengthens and reinforces hair fibres whilst conditioning. Majirouge can lighten up to 3 levels and each shade gives perfect coverage of up to 100% white hair. Develops in 35 minutes. In 2015 L'Oréal developed an exclusive technology, a molecule called Carmilane™ to make those majirouge reds even richer! Carmilane™ forms an incredibly strong bond with the hair fibre which helps to secure the colour deep within it. The result is red with a unique, multi-dimensional structure with L'Oréal's best ever fade-resistance. For best results use with L'Oréal Professionnel Stabilised Cream Oxydant.